October is a very busy month at the London art scene. The biggest and most talked about event is the Frieze Art Fair, which is steadily growing and gaining status as the most important contemporary art event of the year. However there is a growing number of smaller fringe events that are also getting more popular and interesting. The New Sensations was launched six years ago by the Saatchi Gallery and Channel 4. It is for young artists in the UK. The great thing about the exhibition was to see the huge variety of work and mediums used, ranging from traditional oil painting to sculpture and mixed media installations. All in all the works were following global trends of contemporary art. Sometimes there was a feeling of almost trying too hard to make something that stands out from the crowd, yet the delivery was not entirely successful. On the other hand it was nice to see some some young artists still using more laborious techniques like traditional painting compared to very popular found objects trend. The work by Lee Holden in the top image is called Pervading animal, or a laughter of unease. 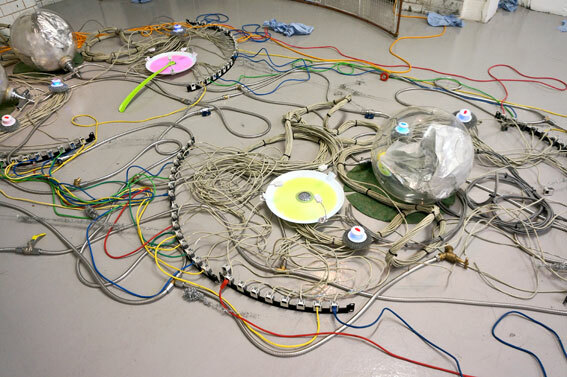 The installation comprising of discarded network cabling and electronic equipment, compressed air, disposable wine kegs, scourers, ceramic plates, plumbing parts and fittings, washing machine liquid conditioner, bath cream and other toiletries. The simple sculpture by Nika Neelova is called Principles of infinity . It is a reassembled mahogany bannister one flight of stairs. The Other Art Fair has grown to a major event where you can buy works directly from over 100 artists. From just being an exhibition, it is now becoming more of an event. During the fair there are now lecture series, workshops and presentations e.g. for trying out 3D printing. Many of the exhibitors were actually selling craft instead of fine art. At the moment the lines between the two are increasingly blurring. The craft of Taxidermy is going through sudden renaissance at the moment. It is about delicate preservation of animal skins in Victorian and Edwardian style. During the fair there were popular workshops to construct a taxidermy creation.